intended for major mainstream and retail consumption. because I haven’t found that place yet. place where I can feel at home. That I almost won’t be able to stand myself. That’s when I’ll be whole. When I find it I’ll be more than content. Yes, that’s when I’ll be free. 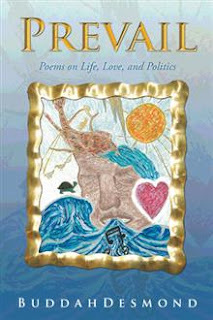 “Free” is featured in the “Life” section of Prevail: Poems on Life, Love, and Politics. Prevail is available at iUniverse, Amazon (Paperback | Hardcover | Kindle), Barnes & Noble, Book-A-Million (Paperback | Hardcover), and other retailers. This entry was posted in Life, Prevail by BuddahDesmond611. Bookmark the permalink.